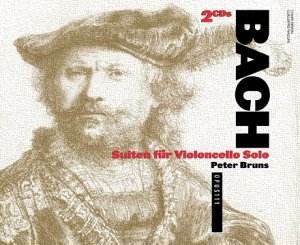 Violoncello Suites 1 - 6, BWV1007 1012. Peter Bruns - cello (Tononi cello - Venice 1730). Digital Recording, Recorded May 1996 at St. Jean de Grenelle Church, Paris. This disc has emblazoned on the cover "This is one of the best recordings of the year - possibly of the decade." This tends to make this reviewer highly suspicious. I would not agree with the comments, but this is not to criticise the discs for they preserve very proficient and lively performances. Born in 1963, Peter Bruns began studying cello, flute, guitar, piano and organ at the Eisler Music School in Berlin with Peter Vogler. He subsequently attended master classes with Tobias Kuhne, Siegfried Palm and Heinrich Schiff. He is principal cellist in the Dresden Staatskapelle and also holds a similar position of lead cellist in the Bayreuth Festival Orchestra. He plays chamber music, as cellist in the Dresden Piano Trio, and is one of the artistic directors of the Moritzburg Castle Chamber Music Festival. His credentials are therefore first class and on the face of it should be able to turn in good performances of these suites, a cornerstone of the solo works for the cello. This he does, and with stylish playing and very truthful recording quality, why do I have reservations. These are to do with the microphone placement with relation to the soloist. This is very close, indeed so close, that in addition to the very musical sounds emanating from the instrument, the sounds of the soloist's fingers on the finger board plus grunts and heavy breathing are clearly evident. This tends to distract from the very musical sounds otherwise audible. If these distractions are not likely to affect you, then I can recommend these performances - I enjoyed them very much. In today's very competitive market however, when you can buy similar priced sets by Rostropovitch (EMI), Yo Yo Ma (Sony) and mid-priced offerings by Fournier (DGG) and others, these current discs are uncompetitive.